The Highest Potency For The Most Discerning User! The New Zealand grass fed whey you find at Proteinco.ca is the best protein powder you will find anywhere in Canada we are convinced. While it’s a premium protein supplement, you’ll find our prices are very economical for the quality you receive. Bodybuilders and other professional athletes know our New Zealand whey is the best protein powder they can buy. Even if you are a casual athlete or simply live an active lifestyle, you should give this protein a try and experience why top level athletes count on this particular whey isolate to help the stay at the top of their sport. Top level muscle building support for everyone! You don’t have to be a competitive athlete to see substantial benefits from New Zealand whey Canada. We all need amino acids including good doses of BCAA to keep and maintain muscle throughout our lives. You won’t find a more powerful whey isolate for helping you stay fit and healthy from adequate muscle mass. Here are some examples to show you how to use our New Zealand grass fed whey protein to keep you healthy and strong. Gain Weight - Supports building muscle mass and overall weight gain By fueling your body with the best protein sources, you can gain muscle mass better than ever. Muscle weighs more than fat so even if you replace body fat with muscle, you will most likely gain weight but be leaner and more fit looking. In addition, more muscle mass can boost your metabolism which is also a key to loosing body fat and keeping it off. Making protein shakes with New Zealand Whey Protein Isolate from Proteinco Canada can help you by being the best protein powder you can possibly use. Every aspect of this premium whey isolate points to dramatically improved results when you want to gain weight by adding more muscle mass to your body. Lean Muscle - Helps build a lean body due to being fat and lactose FREE! Our New Zealand grass fed whey protein powder is 27 grams of lean muscle building power in each and every serving. You get 90% protein and ZERO Fat, ZERO Carbs and ZERO Lactose. Because of this, you can’t help but build more lean muscle using this protein supplement regularly. Keep in mind that some fat is good as long as it’s the right kind. We sell Omega 3 to be a source of good fats for when you consume a no fat protein like our New Zealand whey. Lose Fat - Building more muscle can mean a higher metabolism to burn fat faster Consuming the highest quality food and supplement sources can help you lose fat and then assist with keeping it off permanently. This top rated whey isolate is one such source of the best calories on earth. Toxins and lack of nutrient density may contribute to your fat loss efforts being sabotaged more than you know. By consuming a pesticide free, hormone free, antibiotic free, wholesome food source, you should see better weight control and improved overall health. Fitness - Increases strength and endurance improving overall fitness Using New Zealand whey Canada, is a great way to assure you get the right calories at the right times during the day. This can make you feel stronger, give you more endurance when you workout and thus, improve your overall fitness. Being able to train more regularly and harder when you want to contributes to improved fitness and vitality. This is the best protein powder to use for this purpose. Mixing a protein shake several times a day is suggested so you can keep your energy levels consistently high throughout the day. Doing so should assure you never miss another scheduled training session due to lack of energy. Energy - Contributes to consistent energy levels all day Again, when you have high quality calories consistently through the day, it contributes to having more energy throughout the day. If you suffer from low energy at various times during your day, it’s possible you need a shot of calories on a more frequent basis. Protein can be a great source of calories for this purpose as it’s a more long burning energy source. In addition, being easily digested, it won’t sap the energy from you as much as trying to digest large meals consisting of whole foods and particular carbohydrates. Active Lifestyle - Enhances overall health and well being An active lifestyle often means being on the go a lot. The convenience of being able to take New Zealand Whey Protein Isolate with you anywhere so you can mix protein shakes on the go can be a life saver. Never again will you have to suffer from being low on calories. Whey powder is perfect for mixing quick, consuming immediately, and then continuing on with your active day. Take the protein powder with you wherever you go so you always have a quick and easy source of emergency food. Our premium line of isolate protein is our New Zealand Whey Protein Isolate. We use WPI97 from grass fed dairy cattle to bring you New Zealand whey Canada. The benefit to you is the purest, highest quality whey isolate on the planet. Cold processed in a cross flow micro filtration (CFM) process means undenatured raw whey powder is used for maximum whey fraction percentages like Immunoglobulins. The percentage of this important aspect of the best protein powder is much higher than you typically find in lower priced protein. There are also many aspects of the nutrition and daily living conditions of New Zealand dairy cattle used that are impossible to measure. The benefit transferred to your body is found by trying this top rated whey powder and seeing for yourself. Each 30 gram serving gives you a massive 27 grams of pure New Zealand grass fed whey protein. The result is a protein supplement that is 90% protein by weight. When you want the absolute best protein powder possible, New Zealand Whey Protein Isolate from Proteinco Canada has no equal. PREMIUM QUALITY AND RESULTS FROM NEW ZEALAND WHEY! Why is this protein better than other choices we offer at Proteinco.ca? While our standard Whey Protein Isolate is an excellent product and very affordable, if you are looking for maximum potential in your protein supplements, you now have the choice of stepping it up a notch. While the cost is slightly higher, you may desire the absolute finest supplement possible so we thought it was important to offer you that choice. Even if you are satisfied with your current whey isolate, we urge you to treat yourself once in a while with the best protein powder money can buy. GRASS FED WHEY PROTEIN ISOLATE What does it mean to say grass fed whey? Don’t all cows eat grass? Not only can you buy whey isolate that comes from cows that eat little if any grass, you never know what they have been fed. GMO crops like corn are fed to cattle with the health hazards still not completely known. New Zealand grass fed whey protein powder comes from dairy cattle that not only eat grass, they eat grasses that are as pure as you can find anywhere on earth. The benefit to you in substantial which will be evident to you with the first few protein shakes you make from New Zealand Whey Protein Isolate. Cross Flow Microfiltration (CFM) means cold processing that keeps nutrients intact! Rather than use chemicals to isolate the whey, we only use cold filtering processes so as not to denature the whey and lose nutrients and muscle building power. The raw whey we get direct from New Zealand is extracted using a cross flow microfiltration (CFM) process. Other than hydrolyzed whey protein, this is the most powerful WPI we could find. We feel the affordability of CFM process far outweighs the very small benefit of hydrolyzed whey at much higher prices. The result is the best protein powder possible that is also affordable for you the Canadian whey consumer. FREE OF HORMONES AND ANTIBIOTICS GUARANTEED! The New Zealand dairy industry is well known for being the strictest of any other country when it comes to purity. The penalties for cutting corners are immediate and so steep nobody takes the chance. This means you are guaranteed to have New Zealand grass fed whey protein powder that is completely free of hormones, antibiotics and pesticides. You can be 100% certain it doesn't contain rBGH (recombinant Bovine Growth Hormone) or others that are possible from any other whey protein source. While we source our regular whey line from reputable companies in the USA and Canada only, the peace of mind knowing New Zealand is so strict adds value well worth the minimal extra cost. HIGHER IN WHEY FRACTIONS THAN LEADING BRANDS Immunoglobulins are one fraction of whey protein that contributes to supplement potency. In New Zealand whey Canada, they can be as high as 10% vs 2-4% in other brands. This is significant in that your immune system can be substantially fortified just by consuming this type of whey powder. This is just one aspect of this superior whey isolate that can translate directly into better performance and increased muscle building power over other types of protein. GREAT TASTING FLAVORS! We work extremely hard to assure our New Zealand Whey Protein Isolate in particular tastes amazing. It would be a shame to take such a clean and pure whey and destroy it with questionable ingredients. For example, we only use the highest quality stevia for sweetening because we feel artificial sweeteners like sucralose and aspartame aren’t healthy choices. We are working to make every product we sell this way and couldn’t use a better product than New Zealand Whey to start this process. We only use stevia to sweeten all of our protein powders so when you mix your protein shake, you get a lightly sweetened, natural tasting supplement every time. Q –Why do you offer both regular whey and New Zealand whey? A – We choose to offer both so consumers can select which one fits best in their budget. Our regular whey isolate is a fantastic product at an incredible price. For those who want the highest quality whey powder and aren’t as concerned about the price, we offer our premium New Zealand Whey Protein Isolate. Q – When should I consume whey protein isolate? A –We generally recommend 4-6 servings per day depending on your training intensity. New Zealand Whey Protein Isolate is great to consume any time of day. Used in breakfast smoothies, protein shakes for snacks and pre workout and post workout drinks, it should cover your Canada protein needs from supplements each day. Q – Why is New Zealand whey considered superior to all others? A – Due to New Zealand being known for the strictest control measure for their dairy industry, you know you are getting the purest form of whey possible. The cows are grass fed without being subjected to pesticides, antibiotics or growth hormones like rBGH (recombinant Bovine Growth Hormone). That translates into you not being subjected to those toxins either. Q – What are protein fractions and why should I care? A – Protein fractions are naturally occurring portions of any amino acid rich supplement. Various processes can break them down so you end up getting little if any value from them. Immunoglobulins are one such protein fraction that is much higher in New Zealand whey than almost any other protein powder that doesn’t have it artificially added. Q – Is this Cross Flow Microfiltration (CFM) or Ion Exchange whey? A – We use raw New Zealand whey that was “isolated” using a cold process called cross flow microfiltration (CFM) only. There are no chemicals used like those in Ion Exchange processes and others. The advantage is the undenatured aspect from cold processing keeps more of the nutrient powers of the whey isolate intact. Heating degrades the quality and ion exchanges use chemicals that we don’t feel we should ever use for a supplement that starts with whey powder that is so pure. Q – Is this product organic? A – It is not certified organic. However, by New Zealand, the cattle are not exposed to antibiotics, hormones or any other foreign substances. ProteinCo chooses 100% New Zealand whey to ensure superior quality from the start. NZ cows are completely grass fed and guaranteed free of the artificial growth hormone rBGH (recombinant bovine growth hormone), a drug which has been banned by 27 countries for the use in dairy herds. We take the safety, efficacy and purity of our ingredients seriously, from the ground up. In other words, the New Zealand Whey protein isolate from ProteinCo is as close to organic as you can get. Q – Why is it better than North American Whey? A – The New Zealand Whey Protein Isolates comes from NZ cattle, which is not subjected to the same growth conditions as the North American cattle. In fact, they are a lot healthier : North American cattle can be exposed to chemicals, hormones, antibiotics, GMO’s or hyper-immunizations. New Zealand law protects cattle from being exposed to all these foreign substances: they are grass-fed, not factory farmed. Therefore, they are not subjected to the stress most North American cattle can endure, which cause the cattle to release harmful stress hormones. Q – Are you guaranteed New Zealand Whey? A – Yes. We want to offer our customers with the best possible quality of whey protein isolate, which is provided by New Zealand Whey. If you wish to learn more about New Zealand whey protein isolate, do not hesitate to contact our team at Protein Co; we will be happy to give you all the information you need. Q – Why does New Zealand Whey cost more? A – Many factors can cause a product’s price to cost more. In New Zealand Whey’s case, the transportation, grazing practices, proper collection and storage methods and processing are all elements that can influence the quality and cost of whey protein. Q – Is this product good for lactose intolerant people? A – Yes. For anyone with a lactose allergy or intolerance, whey isolate is the best choice. The protein isolation process means all traces of lactose (sugar) are removed as well. WE JUST MADE HEALTHY, HEALTHIER. Certain nutrients are included or omitted in our New Zealand Isolate formula for specific reasons. While some nutrients are naturally occurring, others are added or not in a scientific manner. This is an all-natural New Zealand Whey protein as nothing artificial is added. For those looking for the highest protein content available in supplement form. New Zealand WPI97 is considered the premium protein powder the world over. Beta Lactoglobulin is the primary peptide for the essential amino acid content present to include BCAA. The branched chain amino acids Leucine, Isoleucine and Valine in particular help build muscle tissue during exercise and repair damaged tissues post workout. Lactoferrin is an excellent antiviral, antioxidant, antibacterial and antifungal peptide. It has immune boosting properties and promotes good bacteria and bone growth. By regulating iron absorption, in can help you avoid issues with anemia. Alpha Lactalbumin makes up the majority of protein in breast milk which helps babies develop a strong immune system early in life. It is also an effective detox agent for helping remove heavy metals from the body. This is another great source of essential amino acids to include BCAA. Being high in tryptophan it regulates mood and stress and can improve sleep quality. Processing whey isolate removes all the carbohydrates. We don’t add carbs like maltodextrin so you get 100% protein and nothing else. The protein percentage per serving is at least 90% therefore. Premium Quality - Strict manufacturing standards and certifications Compared to the majority of whey protein dietary supplements available on the market, our New Zealand Whey Protein Isolate is the highest quality whey protein free of fat, carbohydrates, lactose and impurities. 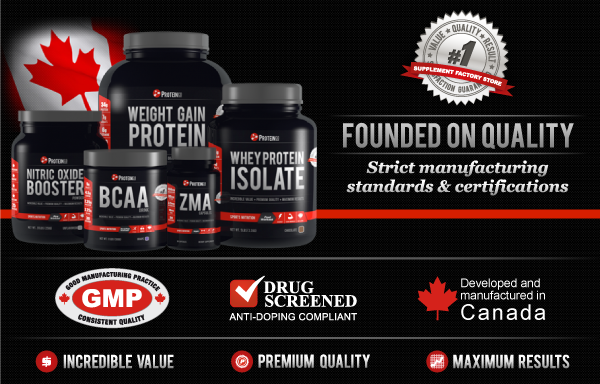 All ProteinCo.ca products, are manufactured to exacting specifications. We manufacture under strict cGMP procedures to ensure the quality you require. Our quality preserving processes means ProteinCo Canada’s New Zealand Whey Protein Isolate powder features an abundance of well-balanced amino acids in conjunction with exceptional amounts of branched chain amino acids, which makes it particularly appealing for individuals who would like to boost their athletic capacities, increase strength and endurance and also promote lean muscle development. Personalizing Add our BCAA Powder, Glutamine or Creatine Monohydrate as required to meet specific needs and training goals. Post Workout A recovery drink containing protein should be consumed IMMEDIATELY after your workout. It’s best to mix your recovery drink right before you consume it so keep the powder in a separate bottle or container until you are ready to mix it. We make our Amino Recovery drink to meet all your protein needs. Adding extra protein using our New Zealand grass fed Whey Protein Isolate can help you personalize a drink that is most beneficial to your specific training goals. Another suggestion is to drink your recovery mix immediately, then consume additional protein once or twice in the 3 hour window following your workout. Whey powder is an excellent choice mixed with water if all you desire is protein without added carbohydrates and fat. Daily Nutrition New Zealand Whey Protein Isolate can and should be consumed regularly throughout the day. If you want to maintain low calories and high protein, mix it with water only. Should you need or desire more calories, mix with juice, fruit, milk and/or any one of our powders designed for you to add and personalize your mix.